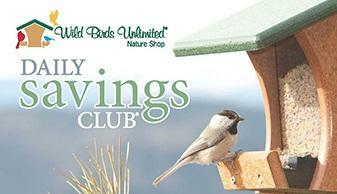 Members of the Daily Savings Club® receive 15% OFF the regular price of all our exclusive, fresh, high-quality bird food. That means you get the best price on the Best Bird Food in Town every day! Stop by soon to hear what Mother Nature is doing in our neck of the woods and to save 15% on all of our bird food.